During World War Two, death and violence permeated all aspects of the everyday lives of ordinary people in Eastern Europe. Throughout the region, the realities of mass murder and incarceration meant that people learnt to live with daily public hangings of civilian hostages and stumbled on corpses of their neighbors. Entire populations were drawn into fierce and uncompromising political and ideological conflicts, and many ended up being more than mere victims or observers: they themselves became perpetrators or facilitators of violence, often to protect their own lives, but also to gain various benefits. Yugoslavia in particular saw a gradual culmination of a complex and brutal civil war, which ultimately killed more civilians than those killed by the foreign occupying armies. 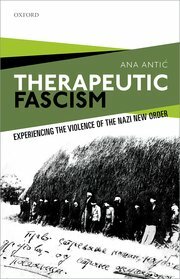 Therapeutic Fascism tells a story of the tremendous impact of such pervasive and multi-layered political violence, and looks at ordinary citizens’ attempts to negotiate these extraordinary wartime political pressures. It examines Yugoslav psychiatric documents as unique windows into this harrowing history, and provides an original perspective on the effects of wartime violence and occupation through the history of psychiatry, mental illness, and personal experience. Using previously unexplored resources, such as patients’ case files, state and institutional archives, and the professional medical literature of the time, this volume explores the socio-cultural history of wartime through the eyes of (mainly lower-class) psychiatric patients. Ana Antic examines how the experiences of observing, suffering, and committing political violence affected the understanding of human psychology, pathology, and normality in wartime and post-war Balkans and Europe.